In this piece, Cherie Hu speculates on four important way in which the music business, or more specifically the music video business, will radically transform in 2019 for both creators and consumers alike. By Cheri Hu. This first appeared on Forbes. Cohen didn't just switch around the words “audio” and “visual” for fun: the new economics of digital music and media arguably demand it. During its heyday in the '90s, MTV provided a valuable channel for major labels to shape the visual appeal of its biggest stars, from Michael Jackson to Madonna, but nailing that video placement was always secondary to driving record sales. Overall, during the "golden age" of recorded music in the last two decades of the 20th century, videos and live tours were often treated as advertisements for albums—prioritizing the commercial performance of the audio over that of the visual. Nowadays, it's the other way around. The margins on streaming are much lower than on physical purchases, and while major playlist placement can give featured tracks up to six figures of additional revenue, many in the industry have expressed disillusionment around the strategy's efficacy for long-term fan development. As a result, artists are increasingly incorporating video and other visuals not just into their creative processes, but also into their business models from the very beginning of a project, turning to captive audiences on the likes of Instagram, YouTube, TikTok and even Netflix for support. In fact, music plays a crucial role in convincing venture capitalists about video's potential for growing consumer businesses across the board. For instance, in a recent blog post about the future of consumer startups, Andrew Chen, General Partner at Andreessen Horowitz, writes that video is “the new technology at scale." To back up his point, he appropriately cites the fact that while it took the 2012 video for Psy’s “Gangnam Style” almost five years to reach three billion views, the 2017 video for Latin crossover hit “Despacito” accomplished the same feat in just one year. As the video-tech landscape continues to evolve and scale in 2019, so will the creative benefits and challenges it offers to the music industry. Below are four ways that the business of music videos will change this year, along the axes of aesthetics, delivery and monetization—with specific examples of artists who are already moving the needle. 1. They will be livestreamed. At its most powerful, music fosters shared, emotional connections—whether virtually between an artist and a fan on a streaming platform, or in person between a full stage production and tens of thousands of fans in a stadium. For many artists, live events also comprise a more profitable revenue source than recorded music, as it can take a song up to a few years to recoup on its expenses in a streaming-first landscape (if it does at all). A-list artists are repeatedly making the case that their fans crave these shared events virtually as much as in person, especially if the artists themselves are in command of the execution. Kanye West used a relatively small live-streaming app called WAV to broadcast the release party for his album Ye, which catapulted WAV to the top of the Music charts in the iOS App Store. Ariana Grande attracted up to a record-breaking 829,000 simultaneous viewers to the live premiere of her music video for “thank u, next,” which she and her team orchestrated using YouTube's Premiere feature. One of the biggest opportunities in live-streaming revolves around the derivative ecosystem of content that can come from a given broadcast. In his blog post, Chen emphasizes the potential of “video-native” products, which he defines as “any product that automatically generates video when users engage.” Minimizing the amount of friction to video creation can encourage “more video-sharing activity, thus more viral acquisition and engagement,” writes Chen. Esports is a perfect example of a “video-native” product, in large part because of its vibrant livestreaming culture on platforms like Twitch and, increasingly, YouTube and Facebook. It’s no coincidence that a growing number of artists and record labels are partnering with esports companies to cash in on these naturally viral dynamics. Of course, music videos are by default "video-native"—and, at their best, highly meme-able—yet they have intersected surprisingly little with livestreaming to date, perhaps because the business model around the format remains relatively unsettled for the long tail of artists. 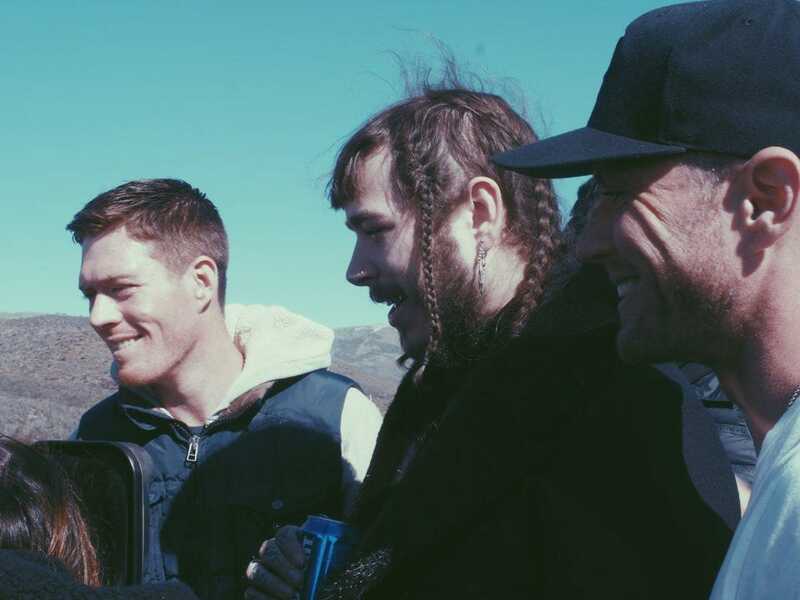 While brands seem comfortable with one-off sponsorship opportunities for livestreams of larger events like Coachella and California Roots, the market for dynamic advertising against livestreams from more emerging artists and personalities is still relatively more freeform, even on the biggest platforms like Twitch. Aside from ads, another source of potential revenue in livestreaming involves direct contributions from users, in the form of pay-what-you-want donations or "tips"—a model that is already being normalized in some non-Western markets, and which is discussed in the next section. 2. They will enable more financial support directly from fans. Crowdsourcing funds for music videos is nothing new. Platforms like Patreon allow artists to set up pay-what-you-want crowdfunding structures on a project-by-project basis, such that fans can contribute anywhere from $1 to $100 for each video an artist releases (see Amanda Palmer and Peter Hollensfor key examples). What is relatively newer in the music world is the concept of micropayments for videos, both during and after their release. When Chinese music giant Tencent Music filed to go public on the New York Stock Exchange, the company's financial statements revealed a surprising alternative business model compared to that of a standard Western streaming platform. Tencent made over 70% of its music revenue in Q2 2018 not from audio streaming, but rather from “social entertainment services,” including in-app monetary “tips” and other virtual gifts that users could send to each other. Many digital influencers across Asia and around the world treat these micropayments as a core income stream, potentially earning as much as 50,000 yuan per month from tips alone. On Western platforms, the micropayment economy is still young, and is often tied closely to live-streaming. Twitch viewers can purchase virtual gifts known as "Bits" for their favorite streamers, while select YouTube users can pay to highlight their messages during a given channel's livestreams (which includes the Premiere function that Ariana Grande used for "thank u, next") by purchasing "Super Chats." 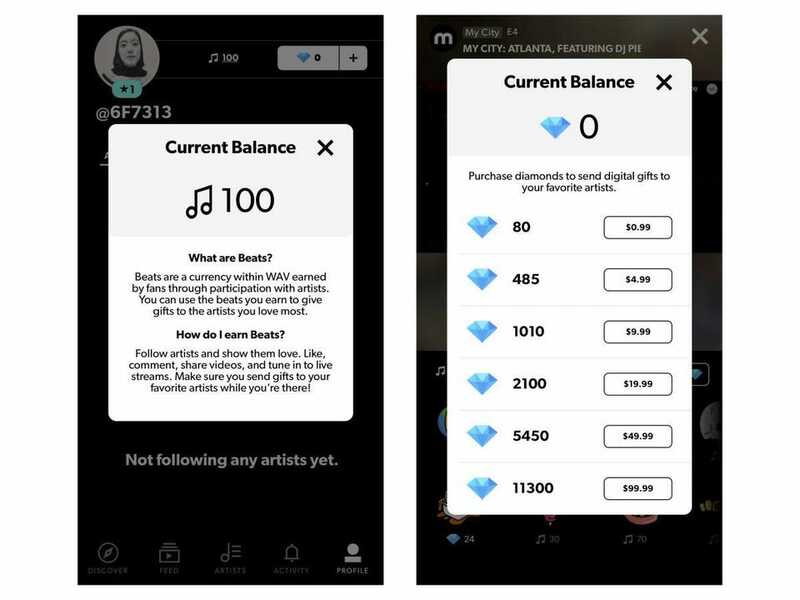 WAV is also experimenting with in-app currencies named Beats and Diamonds that fans can either purchase immediately or earn over time through social participation, then gift to their favorite artists regardless of whether or not they are livestreaming (screencaps below). Importantly, several music magazines, including Mixmag and The FADER, also maintain their own video accounts on WAV, and can attract financial support through these same micropayment mechanisms—a model that could be potentially game-changing for the future of music journalism. The world of in-app tipping for videos is still a can of worms when it comes to licensing, however, as some of the most popular apps that enable direct fan contributions—including Twitch and the myriad of music apps under Tencent—share little to none of that revenue with labels or publishers. Perhaps this is why recorded-music rights holders are still investing more in more passive, backend micropayments through content ID and digital fingerprinting. Popularized by YouTube, content ID is becoming an increasingly widespread and lucrative reality across social media, in part thanks to landmark licensing deals that Facebook signed with all major labels and publishers over the last few years. 3. They will get shorter—and longer. Video content of all lengths have thrived on the internet, but the types of videos that artists, labels and brands are willing to invest in seem to fall along two opposite ends of an increasingly polarized spectrum of length, price and attention spans. When it comes to video, music marketing strategy does seems to be following this forked path. On one hand, many in the industry still argue with their dollars that short-form reigns supreme: Geffen Records deepened its Lens partnership with Snapchat, new hashtags and dance challenges continually pop up on TikTok, Dubsmash and Triller and Instagram Stories has become a must-have channel for music marketing and fan-engagement campaigns in recent years. But many musicians are also unafraid to become more cinematic in their visual endeavors, not less—and, ironically, often use short-form media tools to help execute on their long-form goals. For example, even if you listened to Tierra Whack’s debut project Whack World on Spotify thirty times in a row, you wouldn’t be able to understand the true aesthetic and context behind her lyrics or production, or how the songs might relate to each other, without watching her 15-minute YouTube video for the album. But users who don't want to sit through 15 minutes straight of content can also consume visuals piece-by-piece on the rapper's Instagram profile, where she posted 15 separate, 1-minute videos for each song on the album (screencap below). At the major-label level, while overall budgets have declined since the '80s and '90s, the amount of creative effort and manual labor to construct high-quality videos has not. Andrew Listermann, CEO of Riveting Entertainment—a video production company that has worked with the likes of Tyga, Post Malone, G-Eazy and Lady Gaga—claims that it takes an average of 1,000 man hours to create each music video for a given client. 4. They will be personalized, hyper-localized and context-aware. The music video sector is increasingly set on drawing inspiration from Netflix when it comes to pushing the boundaries of personalization and localization. Speaking at the Web Summit in November 2018, Netflix’s Chief Product Officer Greg Peters shared some interesting stats around the importance of content localization on the video platform. For one, localized shows—those with “local realities plus universal themes,” in the words of Peters, and produced in a local native language aside from English—have high international viewership on Netflix. The Brazilian dystopian thriller 3% received over 50% of its viewing hours from subscribers outside Brazil, while the German-language series Dark received 90% of its viewing from outside of Germany and was a top-10 TV show in 136 countries a month outside of launch. Secondly, dubbing—recording film/TV dialogue in a different language, superimposed over the original—is an underrated art form and science, and has a significant influence on viewing and completion rates on Netflix. According to Peters, 85% of U.S. subscribers watch international content in dubs, and are much more likely to finish in dubs. The video company currently dubs its content in 10 languages for adult content and in 26 languages for kids’ content, and is making it a priority to “improve the quality of the translations, to preserve the original intent of the creator through that localization process,” said Peters. These efforts align with Netflix's wider mastery in personalization: the service has gone so far as to customize the cover art of all shows and movies on its homepage to each individual user. With its new interactive film Bandersnatch—released as part of the Black Mirror franchise—Netflix even hints at a potential future where users can choose their own soundtracks to their favorite flicks. Some music streaming platforms like Spotify are already taking note of the importance of localization. For instance, Spotify has created bespoke pages for K-pop, Latin, Afro and Arab playlists to accompany the service’s expansion into more international markets across South America, Asia, Africa and the Middle East. The company also takes temporal context into account, automatically organizing user homepages by time of day (e.g. “Afternoon chill” playlists in the afternoon, “Coffeehouse” playlists in the morning). But is it possible to translate this type of strategy from the wider platform level to the individual artist and label level? In fact, certain genres like K-pop have already been experimenting with localization for years. The boy band EXO, which is currently a single group, used to be divided into the two subgroups of Exo-K and Exo-M, who would perform the exact same songs but in Korean and Mandarin, respectively. In 2016, one of K-pop’s biggest production companies SM Entertainment launched Neo Culture Technology (NCT), a experimental supergroup with several local “teams” around the world that can release different albums simultaneously in multiple languages. Inspired by these ideas, managers and labels in Western markets are also beginning to think about how to dub their artists’ music videos with international lyrics to cater to more diverse audiences. But even if this localization doesn’t happen on the lyric level—the dubbing process is labor-intensive, particularly as the number of languages stacks up—another high growth area for music videos is visual localization, à la Netflix’s custom cover art. For instance, throughout the second half of 2018, Universal Music Group released not one but six different vertical videos of Chantel Jeffries' single "Wait (featuring Offset & Vory)" on Spotify, each of which was tailored for a different playlist on the service (specifically skate, travel, Latino, pride, DJ and party playlists). As Spotify tries to expand from being "just" a music company into providing other types of multimedia content for its users, including but not limited to videos, one can expect both major and indie music companies to jump on the bandwagon on visual as well as aural personalization. Such strategies dramatically expand the number of contexts in which a song can be heard (and seen) for the first time—creating more flexibility for listeners and fans, while staying to true to the creative vision, and growth ambitions, of the artist. Cherie Hu: I'm an award-winning music writer and researcher, passionate about propelling innovation in the music industry using a combination of in-depth business acumen and data-driven storytelling. I take particular interest in how emerging music markets, technologies, leaders and tastemakers make their dent in the status quo. In addition to Forbes, I've written for publications including Billboard, Variety, Music Business Worldwide, Pitchfork and Rolling Stone. I've spoken at over 20 conferences to date, including SXSW, Sónar+D and the Web Summit, and my newsletter Water & Music reaches over 2,000 creative professionals every month. Before diving into journalism, I spearheaded a research project on innovation in music at Harvard Business School, interned at Interscope Records and Ticketmaster and studied classical piano at Juilliard.